Kids are extremely impressionable, and during their development years it’s important to give them appropriate equipment to give them the best chance of falling in love with the game of basketball. 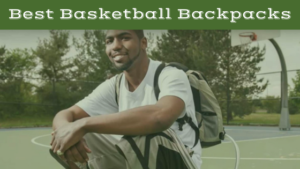 Basketballs that kids require can be very different from the regular ball you may use, and it’s important to do your research to find out the best ball for your child. 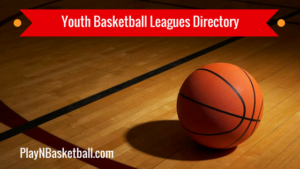 This article will enable you to do just that, helping you to find the best basketball for kids this 2019 season. 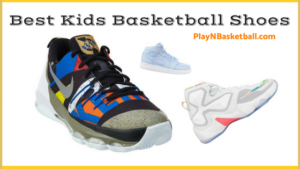 Basketball sizes: what is the right way to find the proper basketball for my child? 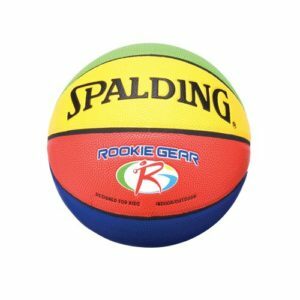 Spalding Rookie Gear Indoor/Outdoor Composite Youth Basketball Review: The Spalding Rookie Gear Basketball is technically designed for children aged 8 and under, though if your child is a little older they’ll definitely still enjoy this product. This is the best size 5 basketball for kids, with its 27.5 inch circumference making it easier for their smaller hands to grip and shoot the ball. It also weighs 25% less than standard youth size balls, meaning your kid will be able to more easily develop the fundamental skills of the game before moving onto a larger, heavier ball. It is made of an extremely durable composite leather, making it great for use both indoors and out. To cap it off, the ball comes with a colorful exterior, which will no doubt appeal to a younger child. There are very few flaws and a lot of positives to this ball, so give it a try. 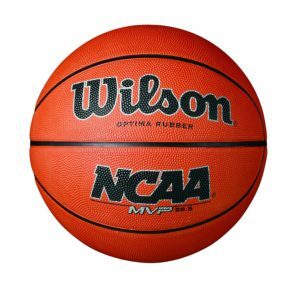 Wilson NCAA MVP Rubber Basketball Review: The Wilson NCAA MVP Rubber Basketball is more suitable for older children, who will most likely love this ball. Wilson are the makers of the official ball of the NCAA, and essentially this product is a rubber version of the one the college stars compete with. The rubber exterior is perfect for a child, making the ball that little bit lighter to make it easier for smaller kids to work with. 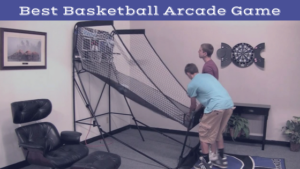 It is relatively bouncy, which makes it great for rebounding practice, and is extremely durable. Rubber covers generally last for longer as an outdoor basketball than composite leather balls, and this is no exception. The durability of this ball, combined with the fact that it handles well and feels great, make it the best youth outdoor basketball on the market. Spalding 2016 All Conference Basketball Review: If your child is beginning to grow, or even just developing a pretty high level of skills, they may be ready to move on from the more childish basketballs. This ball is a great stepping stone between balls specifically made for children, and adult-sized basketballs. 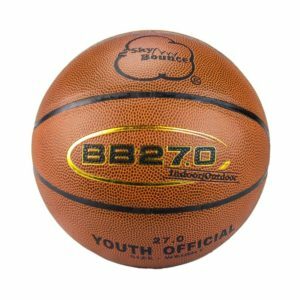 Available in a 27.5” youth size, this ball will enable your kid to make the transition to full-sized, competition quality basketballs. The ball is made from a composite cover, which very closely mimics leather, meaning your child will be able to handle this better than any other ball they have used before. It is designed for both indoor and outdoor play, but such is the quality of the cover that it feels just like an indoor, genuine leather ball. With an NBA logo plastered on the front of the ball, your child will love the look, making this the best indoor youth basketball available. Mikasa Youth Basketball Review: This is the perfect ball to get your younger child into the beautiful game. With a 25.5 inch circumference, it is ideal for small hands to learn how to dribble like Kyrie Irving and shoot like LeBron James. The durable rubber cover makes this ball great for outdoor use, and your child won’t have to worry about damaging it if they leave it out in the rain. The wide channel design makes it even easier to handle this ball, while the construction of the ball ensures you’ll get a whole lot of use out of this ball. Overall, this is the best size 4 basketball for kids, and one that is definitely worth buying. SportimeMax Hands-On Basketball Review: This ball will help to teach your kids the fundamentals of the game as they practice. The SporttimeMax Hands-On Basketball has hands printed on to the cover of the ball to show your child where to place their own hands as they develop their killer jump shot, or elite passing game. Often, balls like this, which have extra gimmicks, can lose out significantly in quality, with their main focus being the extra feature they have added to the product. Fortunately, that isn’t the case here. Even in the absence of the hand imprints, this would be an excellent ball. The rubber cover feels good in the hands and bounces consistently, and of course lasts a long time. This is close to the best basketball for kids this 2019 season. 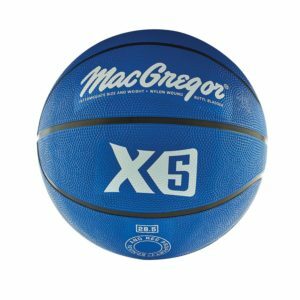 MacGregor Multicolor Basketballs Review: This is an example of a ball that does lose quality in exchange for a gimmick. MacGregor have marketed this ball to children through the multiple color options available, but unfortunately the ball itself is relatively flawed. Predominantly, these problems relate to air retention. Many users complain that the pump valve is defected, and won’t properly inflate the ball. Other complained that the ball goes flat within a week, and requires constant pumping. When it is pumped up, the ball is okay without being outstanding, but all the problems associated with it means it’s probably best to avoid this youth basketball for kids. 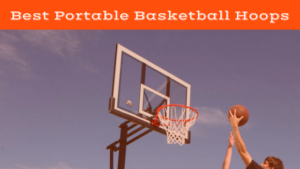 Sky Bounce Brand Basketballs Review: Quite simply, these balls just have way too many problems associated with them. As is often the case with lower quality basketballs, many users complained about their inability to retain air, with some complaining they went flat within a day of use. The synthetic leather is supposed to make it suitable for both indoor and outdoor play, but it is not; using it outdoors results in a relatively rapid wearing away of the rubber. 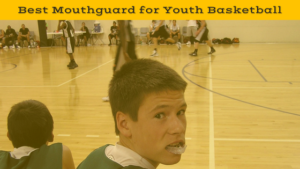 On top of these problems, it also bounces inconsistently, which will make it very hard for your child to develop proper dribbling techniques, as they will be dealing with a ball that doesn’t reflect the kind of ball they will use in competition. This is the worst basketball for kids this 2019 season, so don’t bother with it. It isn’t always easy to buy gifts for children, and purchasing a youth basketball is no exception. You want to ensure you get something your child will enjoy, and which will help to develop their love of the game, and to do this there are a number of important factors that you need to consider prior to your purchase. Age: This is probably the single most important thing that needs to be considered before you buy a basketball for your kid. The simple fact is, kids grow up fast, and the needs of an 8 year old are going to be vastly different from the needs of a 14 year old. 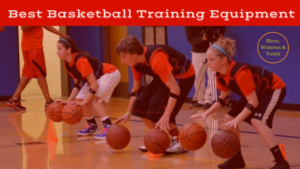 Younger children are much more likely to need smaller basketballs so that they can learn to properly dribble and shoot, and if they are forced to use a much larger ball it will hard for them to develop these skills. In contrast, as children head towards adolescence they will be more inclined to want balls that closely represent those used by their heroes. In this case, composite leather basketballs that are close to full size may be the best option. There are a plethora of choices, and it can be hard to narrow down what is the most suitable for the age of your child, but just by considering the factor, you’re halfway there. Skill level of your child: Is your kid just a social basketballer, keen to have the occasional shoot around with mom and dad? If this is the case, maybe a more inexpensive, rubber basketball will do the job. In contrast, maybe your child is starting to develop some serious skills, and really wants to take things to the next level. In this case, the needs of the child will be completely different. If they are still younger then a full size basketball probably won’t be appropriate, but a youth sized ball that feels and behaves similarly to a competition level basketball might be the best option. Cover material: This is directly related to the two factors above, and is something that you really need to consider prior to making your purchase. You might even need to ask your child what they prefer if you aren’t sure, as the difference between a rubber ball and a composite leather ball is significant. Rubber balls don’t mimic genuine, indoor balls particularly closely, and they are often a little bouncier and a little lighter. This doesn’t necessarily need to be a bad thing, and may be the preference of your child. They also tend to last a little longer, particularly when used on an outdoor surface, and are often cheaper. Composite leather balls, in contrast, can be of extremely high quality. The best of them feel a lot like genuine leather balls, and offer the best feel and ability to handle out of these two different types of covers. 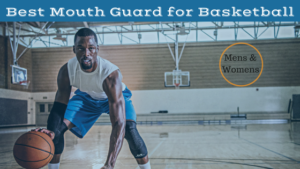 There are certain generalizations that can be used to determine what size basketball your child needs. If, for example, he or she is just 5 years old, you’ll probably be looking at a size 4; an 8 year old might be after a size 5, and an 11 year old a size 6. These are only generalizations though, and while they will hold true in a majority of cases, not all children of the same age are the same height, nor do they possess the same skill level, so it isn’t applicable all the time. Bringing your child along with you to make the purchase, and allowing them to hold the ball in their hands, and try out a couple of dribbles and shot motions, is the most foolproof way to ensure you find the right size basketball. This will ensure that they are happy with the size of the basketball, and a happy child equals a happy parent. Kids aren’t always easy to please, and the difference between a good basketball and a bad basketball can be pretty vast. For that reason, a lot of consideration needs to go into the purchase of a basketball for your child. 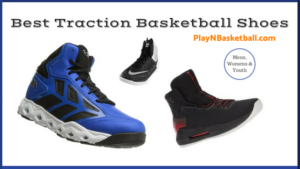 This article has listed the main factors you need to think about prior to buying, as well as some of the best options on the market, to help you find the best basketball for kids this 2019 season.